After leaving Brooklyn, TK Webb, who's released records with Mexican Summer and The Social Registry, spent a lot of lonely hours in Ohio before putting himself back into the social circles. Holed up and hibernating he wrote and recorded himself into a lonesome weirdness. It took an introduction to Times New Viking's engineer and touring collaborator Dustin White to get Webb back in the socializing mood. The friends plucked a rhythm section from a few other Columbus bands and formed Sundown, a psych-folk four piece. Sundown's “Sleepy Song” employs a drowned in sound lethargy that makes it the psychedelic slow burner on the band's Mansion Burning cassette. The majority of the cassette is backwoods folk, and if that's your poison then consider it five shots of moonshine in the morning, but we are going with the heavier side of Sundown, which goes down like the slow sipping of Kentucky bourbon at midnight. “Sleepy Song” manages to wail without burying TK Webb's vocals and create a cavernous boom without sacrificing the balladry. 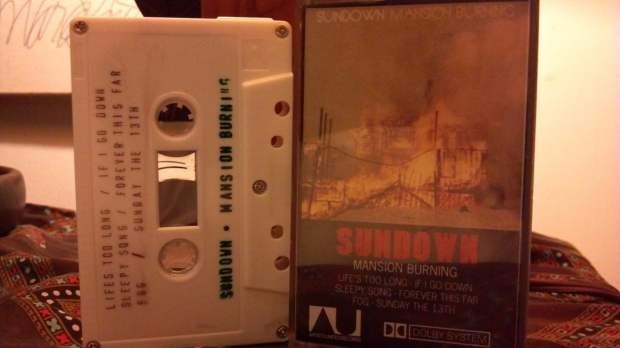 Hear Sundown's Mansion Burning in its entirety here.